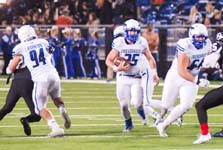 GREAT BLOCKING - Friendswood running back Sam Longbotham (25) finds a huge hole created by Eric Langston (94) and Connor Cross (64) resulting in a 25-yard scoring run for the Mustangs. Friendswood beat cross-town rival Clear Brook 38-22 to finish 7-3 overall and 5-2 in district. The Wolverines finished 1-9 and 1-7 for the season. The Mustangs advance to the Class 6A Region III Div. II playoffs and will face the La Porte Bulldogs (7-3) at the Alvin Memorial Stadium at 7:00 p.m.
FRIENDSWOOD — In the final game of the regular season, the Friendswood Mustangs beat cross-town rival Clear Brook 38-22 that ends the season for the Wolverines who managed only one win this year. In their first season in Class 6A, Friendswood finished 7-3 overall and 5-2 in district to grab third place in the district standings and the No. 2 seed in the Class 6A Region III Division II bracket. The Wolverines were a dreadful 1-9 overall and 1-7 in league action. Friendswood will face Hightower (7-3) in the bi-district round of the playoffs on Friday, Nov. 14 at 7:00 p.m. at Alvin Memorial Stadium which will be a real test for the Mustangs. Many thought that the game against Clear Brook would renew an old rivalry, but it was obvious in the first half that the Wolverines were no match for the Mustangs. 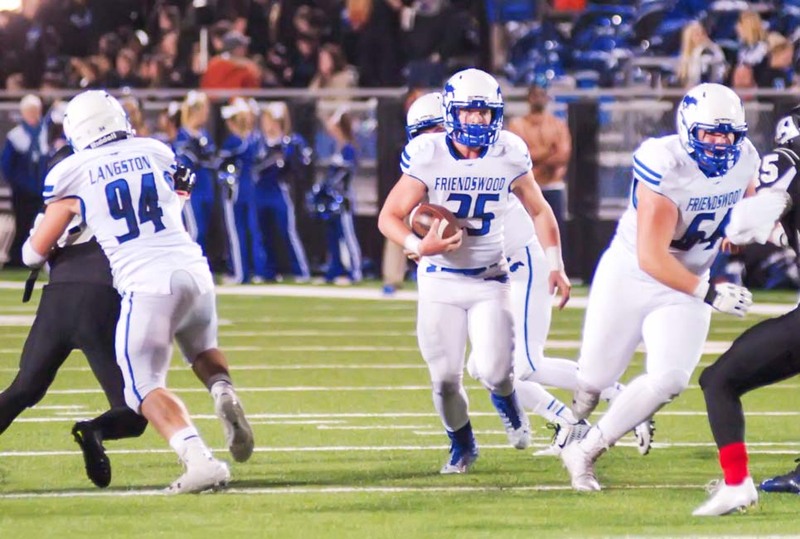 It took only three plays for Friendswood to make the mark on the scoreboard as senior running back Sam Longbotham broke through a huge hole in the middle of the Brook defense and sprinted 45-yards for a touchdown with 10:40 left in the first quarter. Clear Brook managed to answer with a 2-yard run by Stephen Rowe to tie up the game with 4:37 remaining in the opening period. That would be as close as the Wolverines would get as Friendswood scored 21 unanswered point to build a 28-7 lead at intermission. Sean White made it 14-7 when he scored on a 9-yard run. Friendswood added another score when Longbotham raced 25-yards for his second score of the first half to make it 21-7. "That first play that Sam scored on, we were saying that was about as well as we could execute," Friendswood head coach Robert Koopmann said. "We did a great job on that play." Connor Cross, Jesse Brewster, Connor Stanford, and Zach Clement won the battle in the trenches for Friendswood on offense. With 1:54 left in the first half, QB Brandon Sargent hit Joey Crespo for a 65-yard scoring strike for the 28-7 halftime lead. Clear Brook attempted to make a game of it as they used the option to march down the field with the first possession of the second half. The Wolverines capped off the drive with a 5-yard run by Brandon Taylor to close the gap 28-14. But Friendswood would score on a 30-yard field goal by Blake King to increase the margin to 31-14 and then would add another Sargent to Crespo touchdown pass to put the game out of reach 38-14 with 8:48 left in the contest. Clear Brook did get a great 50-yard scoring run by D'Andre Jackson and a safety with 1:58 remaining in the game to make the final score 38-22. Longbotham was the game's leading ball carrier with 145 yards on 17 carries and two scores. Longbotham won the regular season District 24-6A rushing title with 1,305 yards on 191 carries and seven touchdowns. He will continue to add more yards to his total as long as the Mustangs stay alive in the post-season. Sargent was 15-of-21 passing for 193 yards and two TDs with one INT. Crespo ad six catches for 127 yards and a pair of scores.